#IAM is about affirming and owning WHO WE ARE, AS WE ARE as part of Everyone Matters, a global campaign bringing together local governments, public figures, organizations, schools and global citizens – advocating for everyone’s right to dignity and respect, and to be allowed to be who they are – without judgment, shame or attack – including ourselves. Sir Paul McCartney is one of the inaugural global figures who has supported the exploding global campaign of dignity and respect, which launched in 2012. 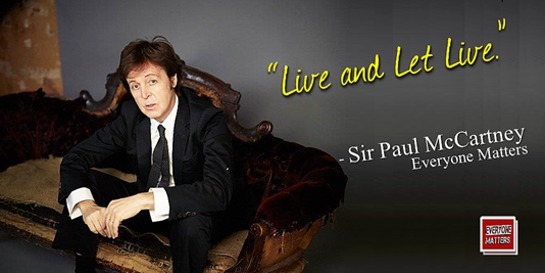 The inspirational quote he offered when he joined the campaign was a signature line – “Live and let live” – from his 1973 Wings’ song, “Live and Let Die,” which was used as the theme song of the eponymous James Bond film. “Live and let live” encapsulates the message of Everyone Matters. A cultural phenomenon, Everyone Matters has quickly grown through social media and in local communities to a following of 165,000 on Facebook – and a Google search engine footprint of 70 million. 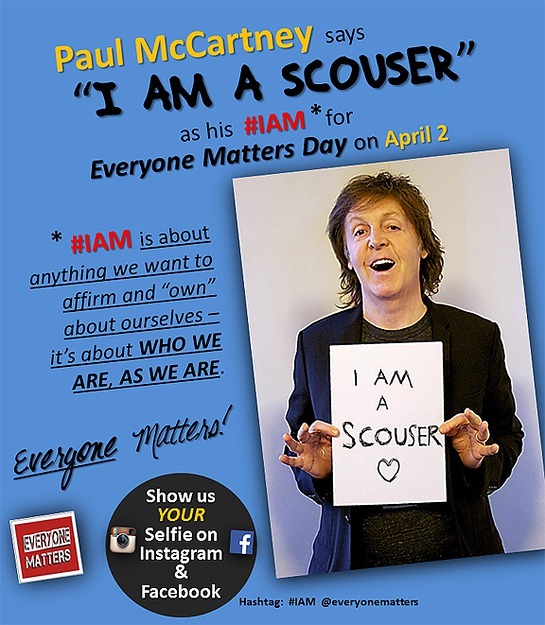 An estimated 75 to 100 schools in the U.S. and beyond will have organized “Everyone Matters Day” for 2013-2014 – many on April 2, with such activities as the “I Am!” pride-in-identity PhotoBooth and VideoWall, where students hold up hand-written signs proclaiming anything about themselves they want to affirm; the “24-Hour Challenge” to not judge in thought or action for the entire day; and the “Letting Go of Judgment Tree” or “Act of Kindness Tree,” in which students collectively share names they’ve been called, or called others, and then “let it go,” or record moments of kindness to others. The cities and states participating in the first global “Everyone Matters Day” – www.everyonemattersday.com – with official proclamations and resolutions commemorating “Everyone Matters Day” and affirming everyone’s right to be who they are, without judgment – are London, Dublin, Los Angeles, San Francisco, Seattle, Dallas, Washington DC, Atlanta, Minneapolis, Memphis, Portland, Phoenix, Denver and the State of Maine. On April 2, 2014, people from around the world will upload their selfies on social media to affirm anything about themselves that they want to proclaim – from a personality trait, to what they like, where they live, ethnicity, sexual orientation, religion. Anything that says who they are, as they are. The concurrent action is #WhyYouMatter and #YouMatter2Me to appreciate and affirm others for who they are. The global leaders who support the humanitarian message of Everyone Matters, and have penned personal statements for the campaign, are: Sir Paul McCartney, Ellen DeGeneres, George Clooney, General Colin Powell, Kevin Spacey, Hugh Jackman, Tom Brokaw, His Holiness the Dalai Lama, Nicole Kidman, Daniel Craig, London Mayor Boris Johnson, Archbishop Desmond Tutu, Nick Clooney and Nina Clooney, Natalie Portman, New York Police Commissioner Bill Bratton, craigslist founder Craig Newmark, Jeff Skoll, Debra Messing, Mary Tyler Moore, Sean Hepburn Ferrer, Bernadette Peters, Christina Aguilera, Deepak Chopra, Dame Judi Dench, Betty White, Fran Drescher and Chris Kluwe. The power – and success – of Everyone Matters is its humanistic, universal yet personal approach. The campaign advocates on behalf of everyone’s right to be who they are, regardless of gender, age, weight, skin color, religion, ethnicity, sexual orientation, physical limitations – combined with the intertwined message that affirms pride in identity. Leading organizations supporting Everyone Matters include The Special Olympics, The Desmond Tutu Peace Centre, Association of American Colleges and Universities, NAACP, National Association of Secondary School Principals, The Museum of Tolerance, Association of American People with Disabilities, National Organization of Women, UN Women National Committee United States, GLAAD, The Trevor Project, Human Rights Campaign, USC Shoah Foundation Institute, Student Affairs Administrators, Equality Now, National Hispanic Media Coalition, MTV’s ATHIN LINE Campaign, National Partnership for Women & Families, Asian American Justice Center, Network National Catholic Social Justice Lobby. The Everyone Matters campaign was founded by social entrepreneur and journalist HeathCliff Rothman, whose previous social media civic engagement campaign was Film Your Issue (FYI). FYI was an issue-driven short film competition with a stellar roster of media partners and jurists that included then-Senator Barack Obama, Walter Cronkite, George Clooney, Anderson Cooper, Tom Brokaw, Philip Seymour Hoffman, as well as YouTube, Microsoft, Yahoo!, MSNBC, MySpace, AOL, MTV and others.